Previous event, full details to follow…. That was quite simply the roughest weather I think I’ve ever fished in, and I’m sure I speak for everyone else too, driving rain and 60mph winds from start to finish, for those of you who decided not to fish, go to the top of the class, as for the rest of us, I’m looking for a good psychiatrist to offer counselling to those who thought fishing would be a good idea !! 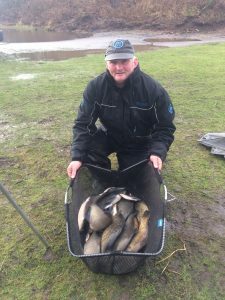 John put up one of the £125 tackle vouchers, gifted by DAIWA at the end of last year’s 3-man team league as a sweetener for the brave souls that turned up – claimed by the overall winner provided he’d fished the league. There was certainly NO pole fishing today, and everyone resorted to feeder rods. This was the only way baits could be presented stationary, although I think anything less than 25 grammes may have trotted off down to the shop end the tow was that severe! After that it was down to choice of feeder and bait on the day, with most opting for maggot feeder. Barry Young got his tactics right today, opting for a small 30g elasticated pellet feeder loaded with sweet F1 green, alternating his hookbaits to keep the bites coming, which produced 5 F1s, 3 small carp, 10 big skimmers and two smaller blades for 34lb 8oz. David McGregor took 2nd place with a decent mix of fish, with Ian Hickson taking 3rd place overall, also with F1s and skimmers, it was literally ounces separating the anglers between 2nd and 6th place. An extremely challenging day for all concerned, well done guys for giving it a go, everyone caught and it’s still winter! !